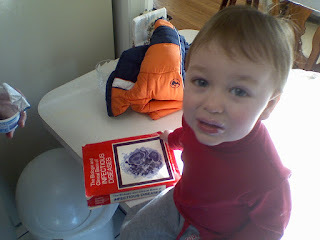 John looks upset in this picture as we're getting ready to leave his daycare because he found a book called The Biologic and Clinical Basis of INFECTIOUS DISEASES on some bookshelf at Farhat's house (her children are both in medical school) and didn't want to give it up before coming home. She said he was carrying it around and "reading" it intensely all day. Fortunately it was mostly theory so there weren't any gross pictures in it, but I just thought it was pretty hilarious anyway.